This is the big win story of how Michael, a 32 year managed to scoop over £290,000 in less than a day of signing up to Vera&John casino. That’s right folks, Michael, not only has a smile on his face but he is now £290,970 richer thanks to a few lucky spins on the Red Tiger Laser Fruit slot. We’ll let you know how he managed to create that huge win, more about the winning slot game, what he plans on doing with his cash and why it pays to play at Vera&John casino online or mobile. We are not ones for rising early, we usually end up walking around like zombies until we’ve had that first cup of coffee, and even then it takes a while for us to focus on anything. But not Michael, he’s up bright and early every day and this day was extra special. He logged in to his Vera&John account after only signing up a day earlier, perhaps after taking advantage of their 200% up to £100 first deposit bonus. 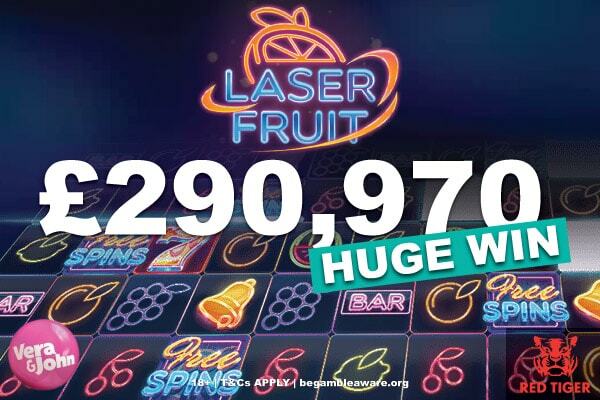 He then opened up the Laser Fruit slot from Red Tiger Gaming which boasts up to 60,446,176 way to win and started spinning. A few spins later and he was £290,970, and smiling from ear to ear like a Cheshire cat. What Michaels win shows is that apparently if you get up early you can accomplish more, we might just have to try it out for ourselves. A neon fruity themed 5 reel slot game with free spins, and up to 60,446,176 ways to win thanks to expanding reels. We bet you’re thinking how does that work? Well, you start each spin with 243 ways to win and then randomly on any spin a laser will shoot out expanding the reels vertically or horizontally giving you more ways to win. But don’t ever expect to reach the top ways to win, in the base game you’re more likely to get a few hundred thousand at max, still providing some decent wins but nothing extravagant. 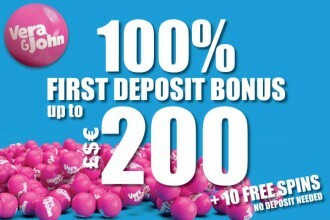 Hit the free spins bonus round though and you’re in for bigger wins. With a random wheel of fortune style game rewarding you with between 3 and 18 free spins, the expanding reels don’t disappear on the next spin like they do in the main game. Instead they keep expanded throughout and give you the chance at unlocking even more ways to win and bigger prizes. Which is how we think Michael managed to trigger his huge slot win. A high variance slot, high limit slot, in can quickly swallow your cash, but can also surprise you on any spin so be sure you use a good slot strategy when picking your bet from the 0.20 min bet up to the 500 max bet. What will Michael do with his casino winnings? It seems that his Lady Luck was looking over Michael as, he’s just been on the look out for a new apartment and is in need of a new car, so this big win struck at just the right time. His winnings will no doubt go towards funding both of those things. And just when he thought his day couldn’t get any better, whilst talking to the VJ staff they offered him access to their VIP program, where he can get special bonuses and promotions and invited to special events. So what did they do, they also invited him to an exclusive VIP event. Oh and cause winning, £290K, an invitation to VIP promotions and special events wasn’t enough they also sent him a brand new iPad so he can enjoy all that Vera&John casino has to offer wherever he is. Now that’s a winning combination of lucky for this brand new player, we wish we had his luck, don’t you. Perhaps Vera&John is just a lucky casino site? There’s been countless big winners at Vera&John casino, whether it’s on some of the biggest jackpot games or games like Laser Fruit we can’t go a few weeks without hearing about a new big win. And why? Perhaps it’s their bright and colourful site that Lady Luck likes to visit or perhaps it’s the fact that they have a huge range of slot machines from a whole range of top providers and newer ones like Red Tiger. With a new slot tournament every day and their generous loyalty program which starts the moment you sign up and frequent casino promotions there’s a reason why players from UK, and Europe keep spinning as they become part of the family. Go to Vera&John, take a look around, plays slots for fun and see for yourself if this is a new casino site you’d like to play for real money. Cause who knows, Michaels luck might just rub off on you.